Mental models determine your thought processes about how things work. They shape your behaviours: how you work, solve problems, relate to people and think about yourself. Mental models are ingrained, fixed structures founded in your beliefs, habits, scripts and biases. They tell you what’s worked for you in the past – and therefore what you should do in a particular situation now. However, these mental models pose a challenge. Albert Einstein was among the first to put his finger on the problem when he said: “We cannot solve our problems with the same thinking we used when we created them”. In today’s world of unprecedented rapid change, digitisation of almost everything, globalisation of many things, disintermediation of traditional relationships with customers and suppliers, and the changing social contract with employees, what worked in the past is unlikely to work now, let alone in the future. In short, you need to think differently. Much of what you’ve learned over the past decades, you need to unlearn. It’s no good fine-tuning and continuously improving your current mental models; they keep you stuck in the past and reinforce the status quo. When you unlearn, you relinquish what you already know or believe to be true, and you choose a new and different mind-set. us will recognise it. You’ve learned to drive on the left-hand side of the road and as a pedestrian you’ve learned to look to the right when you cross the road. When you go to a country where vehicles travel on the right hand side of the road, you have to learn to drive on that side of road and to look left when crossing. It’s not all that hard is it? Well, think back how many times did you catch yourself just in time from turning the wrong way in an intersection or stepping off the curb right into the path of oncoming traffic? Yes, you have to unlearn the habits of a lifetime and your whole being cries out against doing this. There’s a wonderful YouTube video you should watch. 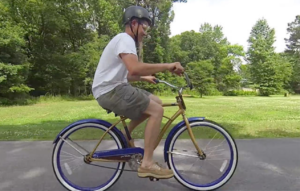 It’s of Destin Sandler and his ‘backwards’ bicycle. I won’t spoil your fun – watch him taking eight months to unlearn and relearn something you might have thought would only take eight minutes! (Skip the ad at the start). Harvard calls this ‘shift thinking’. Visit Mark’s Shift Thinking website for a rich library of the many applications of shift thinking. As Mark explains, this process of unlearning has three parts. Motivation to change. First, you must fully accept that many of your current (i.e. old) mental models are outmoded and no longer relevant in you job, career and, indeed, your life. Upfront, t his is challenging because you are probably not aware of your mental model; it is deeply in your subconscious after all those years. And even if you are aware of it, you are probably afraid of trying to change it. Letting go of something that has worked well in the past is scary, and requires self-awareness and the courage to challenge some of the deepest aspects of self. This is the first and biggest step is asking: Who am I? What do I stand for? What success looks like for me and for others? Visualise the new. Then you have to create a new picture that is better attuned to your business and/or life objectives. The test is not to view your new mental model through the lens of your old one. You have, literally, to break the mould to reinvent the new. Internalise the new. Lastly, you need to ingrain your new mental model, in effect to rewire your brain. This is akin permanently to changing eating habits, rather than going on a diet – which as we all know has little or no lasting effect. You adopt new rituals to embed the learning, which I wrote about in this post: To be a top performer, manage our energy, not your time. Learning to unlearn and relearn, like Destin on his backwards bicycle, takes time and persistence. In Kurt Lewin’s terms, you have to unfreeze before you can refreeze. In my work coaching executives, I have witnessed numbers of my clients shift their thinking in inspiring ways. I have grouped these examples into Self, People and Organisation. They illustrate the many and varied applications of shift thinking. The times we live and work in require agility and open-mindedness about what works and why it works. You cannot – must not – allow yourself to be pushed back into old ways because they are more familiar and comfortable. If there are reinforcing loops (of the Peter Senge, Fifth Discipline type) in the environment, then change the environment – don’t allow yourself to be trapped like a fly in the spider’s web. And if your role models are locking in the ways and successes of the past, find new role models.